TUESDAY, June 20, 2017 (HealthDay News) -- Someday, could controlling your cholesterol be as simple as a getting a vaccination? That's the promise of new research in mice that suggests a vaccine might help fight cholesterol buildup in the arteries. Everyone involved stressed that the research is in its infancy, and good results from animal trials often fail to repeat in people. However, "if these findings translate successfully into humans, this could mean that ... we could develop a long-lasting therapy that, after the first vaccination, just needs an annual booster," said study co-author Gunther Staffler. He's chief technology officer at AFFiRis, the Austrian company that developed the vaccine. "This would result in an effective and more convenient treatment for patients, as well as higher patient compliance," Staffler said in a news release from the European Heart Journal. His team published its findings in the journal on June 20. One U.S. cardiologist who reviewed the findings said a cholesterol-lowering vaccine would be a great advance. "If this is achieved, this vaccine represents a revolutionary breakthrough in our options for the treatment and prevention of heart disease," said Dr. Rachel Bond, who helps direct Women's Heart Health at Lenox Hill Hospital in New York City. The new study was conducted in mice. The rodents were fed a high-fat diet that boosted cholesterol levels, narrowing their blood vessels. Some of the mice received a vaccine that triggered the activity of certain immune system antibodies. These antibodies target an enzyme called PCSK9 which -- if left alone -- helps prevent the clearance of "bad" LDL cholesterol from vessel walls. Compared to mice that didn't get the vaccine, mice that were vaccinated had 53 percent lower total cholesterol, 64 percent less narrowing in their arteries and lower levels of certain markers of blood vessel inflammation, the researchers reported. Staffler's team pointed out that there are already a number of LDL-lowering drugs in the pipeline that target PCSK9. But these medications have to be taken every day and sometimes cause harmful side effects. 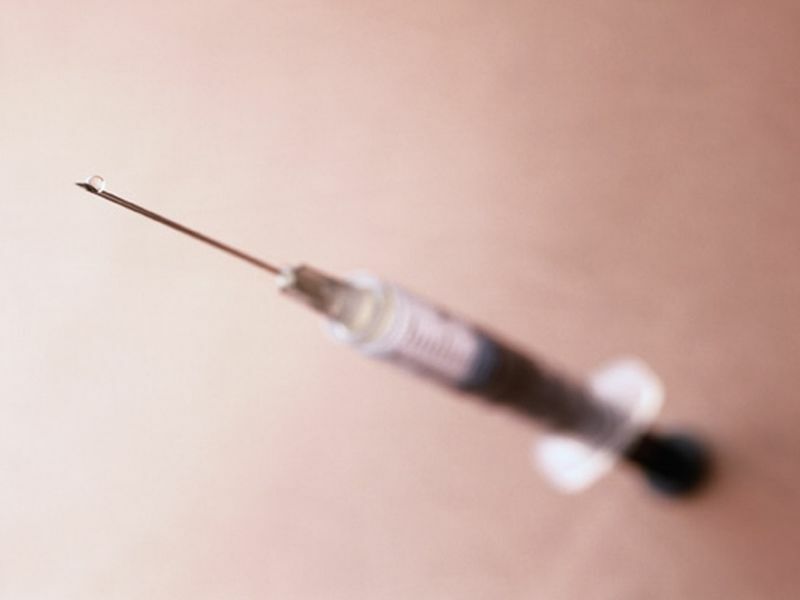 In mice at least, the effect of the new vaccine appears to last long-term. "As antibody concentrations remained high at the end of the study, it can be assumed they would continue to reduce cholesterol levels for some time afterwards, resulting in a long-lasting effect, as has been shown in previous studies," Staffler said. The next step is a trial in humans. According to the researchers, a phase 1 clinical trial to assess the safety of the vaccine is expected to be completed at the end of this year. That trial will be crucial, said the authors of an editorial accompanying the study findings. The "safety, the response in humans and the very important but unknown long-term immune effects need to be very carefully addressed during the course of clinical development," wrote Ulrich Laufs, of Saarland University in Germany, and Brian Ference, of the University of Bristol in England and Wayne State University School of Medicine in Detroit. For example, they noted that the use of statins and other drugs to reduce total cholesterol is associated with an increase in newly diagnosed diabetes. So, "one potential safety concern [from the vaccine] is the potential for an increased risk of new onset diabetes," they wrote. For her part, Bond said that a vaccine that targets PCSK9 would be welcome. The new mouse study "showed that after 3-4 vaccinations administered over a 6-8 week period and up to 6 months, there was a persistent, high affinity to reducing the function of the PCSK9 protein for up to even one year, with limited to no side effects," Bond pointed out. Still, further research "is needed to demonstrate true safety and efficacy in humans," she stressed. Dr. Kevin Marzo is chief of cardiology at NYU Winthrop Hospital, in Mineola, N.Y. He called the findings "exciting," but agreed that "large trials will ultimately be needed to confirm safety" in humans.